The New York Times bestselling authors of Switch and Made to Stick explore why certain brief experiences can jolt us and elevate us and change us—and how we can learn to create such extraordinary moments in our life and work.While human lives are endlessly variable, our most memorable positive moments are dominated by four elements: elevation, insight, pride, and connection. If we embrace these elements, we can conjure more moments that matter. What if a teacher could design a lesson that he knew his students would remember twenty years later? What if a manager knew how to create an experience that would delight customers? What if you had a better sense of how to create memories that matter for your children? 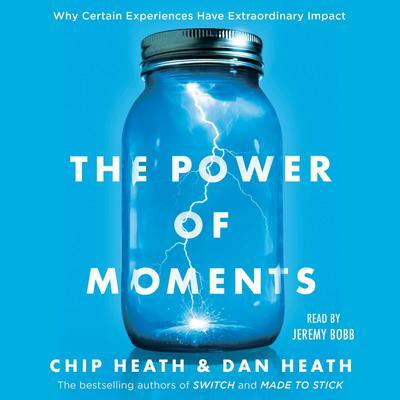 This book delves into some fascinating mysteries of experience: Why we tend to remember the best or worst moment of an experience, as well as the last moment, and forget the rest. Why “we feel most comfortable when things are certain, but we feel most alive when they’re not.” And why our most cherished memories are clustered into a brief period during our youth. Readers discover how brief experiences can change lives, such as the experiment in which two strangers meet in a room, and forty-five minutes later, they leave as best friends. (What happens in that time?) Or the tale of the world’s youngest female billionaire, who credits her resilience to something her father asked the family at the dinner table. (What was that simple question?) Many of the defining moments in our lives are the result of accident or luck—but why would we leave our most meaningful, memorable moments to chance when we can create them? 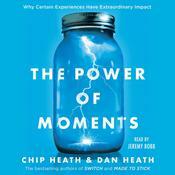 The Power of Moments shows us how to be the author of richer experiences. Chip Heath is a professor at the Graduate School of Business at Stanford University. He and his brother, Dan are the bestselling authors of Made to Stick and Switch. He lives in Los Gatos, California. Dan Heath is a senior fellow at Duke University's Center for the Advancement of Social Entrepreneurship (CASE). He and his brother, Chip are the bestselling authors of Made to Stick and Switch. He lives in Raleigh, North Carolina.